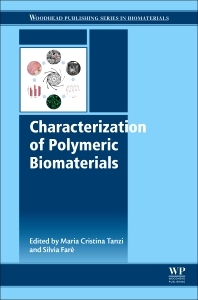 Characterization of Polymeric Biomaterials presents a comprehensive introduction on the topic before discussing the morphology and surface characterization of biomedical polymers. The structural, mechanical, and biological characterization is described in detail, followed by invaluable case studies of polymer biomaterial implants. With comprehensive coverage of both theoretical and experimental information, this title will provide scientists with an essential guide on the topic of these materials which are regularly used for clinical applications, such as implants and drug delivery devices. However, a range of novel polymers and the development and modification of existing medical polymers means that there is an ongoing need to satisfy particular design requirements. This book explains the critical and fundamentals methods to characterize polymer materials for biomedical applications. Biomaterials scientists, chemical scientists and engineers in the applied areas of biomaterial science, tissue engineering, drug delivery and regenerative medicine. Maria Cristina Tanzi was Full Professor of Industrial Bioengineering at the Department of Bioengineering and Department of Chemistry, Materials and Chemical Engineering 'G. Natta' of Politecnico di Milano, Italy; retired on March 1st, 2014. In May 2008 she was nominated a member of The International College of Fellows of Biomaterials Science and Engineering (ICF-BSE). Her main research interests comprise the development and characterization of natural and synthetic polymers and scaffolds for biomedical applications. She published more than 250 scientific papers and she is author of several Italian and international Patents on monomers and polymers for environmental, pharmaceutical and biomedical application. Silvia Farè is Associate Professor at the Department of Chemistry, Materials and Chemical Engineering 'G. Natta' of Politecnico di Milano, Italy. Her research interests comprise the synthesis and characterization of polymeric materials, with special reference to biomedical applications, tissue engineering and cell/drug release. She has published 80 scientific papers; more than 100 contributions to scientific meetings and is the author of Italian and International Patents.